These six custom tenor ukuleles were made for a charity project organized by Luthiers for a Cause. Some of the world’s finest custom builders each built a tenor ukulele from nearly identical woods sourced from two legendary trees to help demonstrate “The Voice of the Luthier.” Originally intended to be auctioned one at a time, all proceeds from the sale of the instruments were to benefit The Ukulele Kids Club, a charity which helps support music therapy in pediatric hospitals. Through its growing network of nearly 200 participating hospitals, UKC has donated more than 4,700 ukuleles to children enduring serious medical conditions and has set a goal of donating 10,000 ukuleles by year-end 2019. At the unveiling of the instruments, Luthiers for a Cause was approached to sell the ukes as a set for $100,000. The back and sides from these special ukes are from “The Tree” , a one-of-a-kind Honduran mahogany tree that stood over 100 feet tall and was 10 feet around. When it was felled in the 60’s, this giant unexpectedly landed in a ravine and remained there for almost 20 years before it was rediscovered. Its unique figuring originally saw it used in custom furniture. Another Honduran mahogany tree with this unusual figuring has never been found. In the 1970’s, a few luthiers began to experiment with making instruments from it. Sounding more like a rosewood than mahogany, its tone also proved entirely unique among Honduran mahogany trees. The soundboard is from Lucky Strike redwood. When this storm-felled giant landed, a 60-foot section of the tree laid over a small ravine and air dried over many years. The redwood from this section of the tree exhibits a much higher strength-to-weight ratio than is typically found in redwood. Asa result, this redwood is often said to exhibit the best tonal attributes of both redwood and spruce. We met up with the LFAC crew and these fine luthiers to get their take on the conception of this project, their motivations, thoughts on wood and more. And of course we’re gonna get amazing musicians to give you some raw sound samples! In this video Corey Bergman, founder of the non-profit Ukulele Kids Club, tells us the heartbreaking path that led him to helping thousands of kids and to improve the quality of their extra challenging lives. Corey has now been able to affect thousands of children and families and this project will generate around 3,000 ukuleles with shipping to the hospitals providing musical therapists. But it’s an emotional ride getting there. Take a look. So I’ve gotten to know Corey a little and he’s just a truly genuine guy that wants to give back to the world. It’s so nice to know that this special charity is run by such an exceptional person. Mahalo to Eddie Monnier for the write ups and specs. Steve Grimes has offered an asymmetrical design in his world-famous archtop guitars for years. He has long wanted to do an asymmetrical design in an ukulele and brought his vision to reality in this wonderful tenor uke with a cutaway. Steve provided a rosette of ivoroid surrounded by rope purfling and lines of black and white. The body is bound with bloodwood, with the same rope purfling. The ebony fingerboard also has bloodwood binding. The bridge features bloodwood and holly veneers. This ukulele also features a slotted headstock with custom Rodgers Tuning Machines. 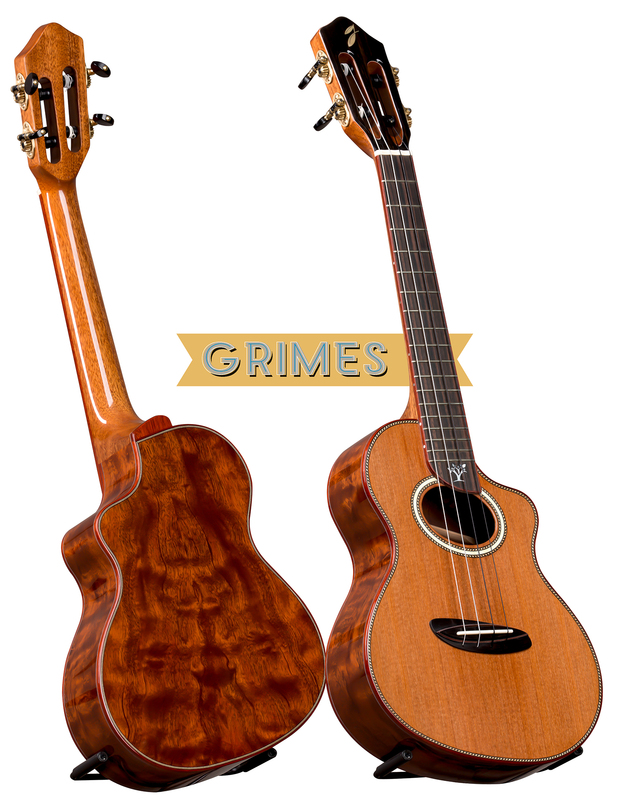 See our feature on Grimes Ukes HERE. This Hive Ukulele features a Zebrawood inlay on the bridge. The Ebony binding and black/maple/black purfling add contrast to the back and top woods. An Ebony faceplate and backstrap adorn Jake’s elegant headstock design. As is standard for Hive Ukuleles, the neck joins the body at the 12-fret. This ukulele features custom Rodgers tuning machines. 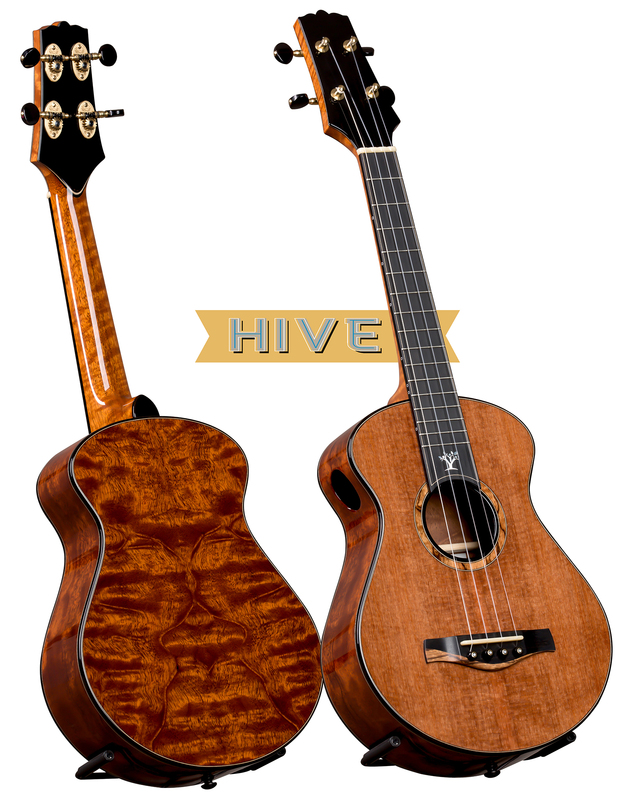 See our feature on Hive Ukes HERE. The Beau Hannam showcases a number of his elegant designs, including his original fading purfling on the headstock, the sculpted heel on the neck, and the tiered fretboard. The custom rosette features mostly The Tree with buckeye burl and ebony details. The body hasan ebony arm bevel for added comfort. Everything (binding, rosette, sideport, armbevel, fingerboard, headstock) has BWB purfling and ebony binding. This ukulele also features custom Rodgers Tuning Machines, which complements the many exquisite features. See our feature on Hannam Ukes HERE. The Jay Lichty tenor hasa 19” scale, which provides a bit more room than a standard tenor. The fretboard has a radius and is bound. For added comfort, Jay added an arm bevel. The rosette is from The Tree and highlighted by b/w/b lines. Jay provided ornate fret markers in Mother of Pearl. This ukulele also features a slotted headstock with custom Rodgers Tuning Machines and a K&K Aloha Twin Spot pickup. 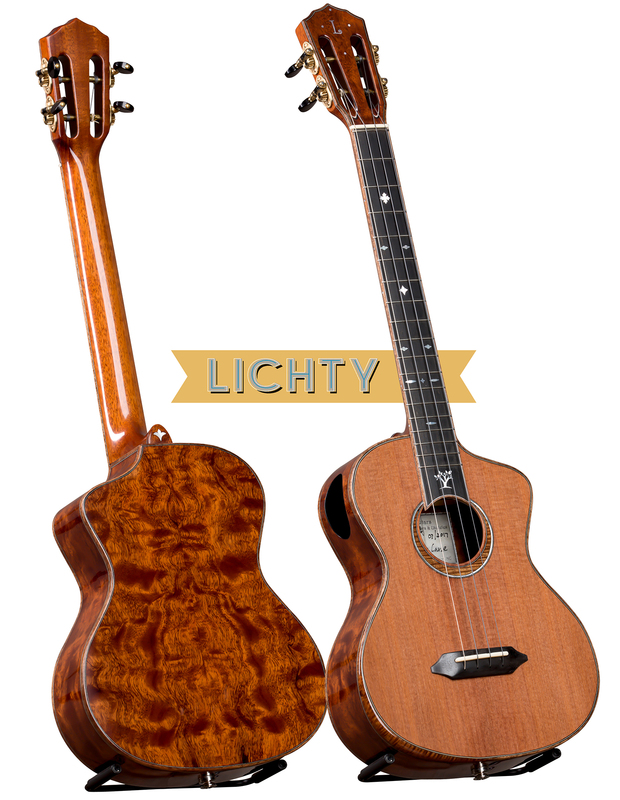 See our feature on Lichty Ukes HERE. Joji Yoshida builds entirely by hand. He uses hide glue joint bracings and uses a French polish finish. 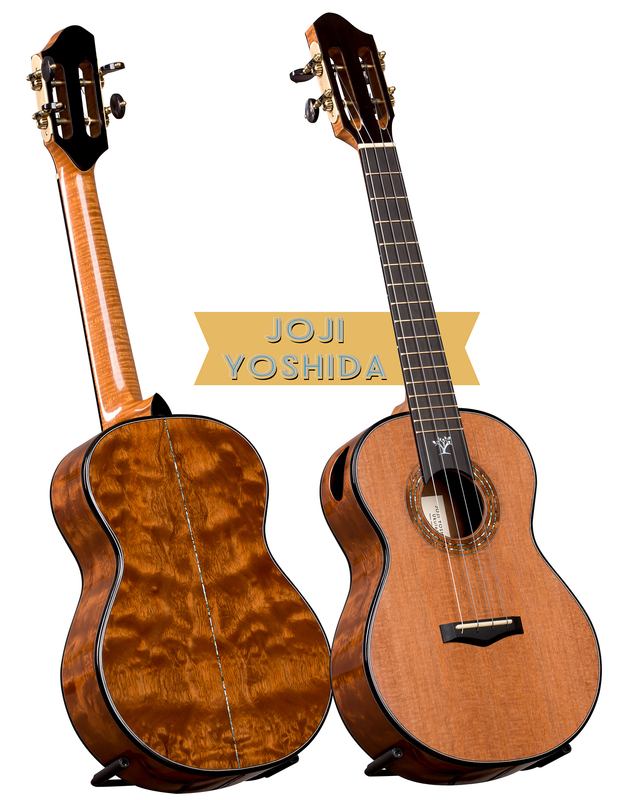 Joji used a simple black/white purfling to showcase the stellar woods. The rosette is from The Tree, with two accent lines of abalone shell. His bound fret board has a compound radius. This ukulele also features a slotted head stock with custom Rodgers Tuning Machines. See our feature on Joji’s Ukes HERE. The John S. Kinnard tenor is based on his Series 3 specifications and features the unique Z recessed headstock with a front plate that is made from the Tree and ebony and a back plate from The Tree. The tuners are Gotoh UPT’s. The drop-necklace rosette is made from The Tree and blue Pau abalone. The back of the neck has a coordinating floating inlay and a heel cap from The Tree. The bound fret board has a compound radius. This ukulele also includes a removable ebony armrest, with an etched Luthiers for a Cause logo. See our feature on John S. Kinnard Ukes HERE. Much love to the talent that made this possible. It was a joy for me to be a part of it. Doing good feels good. But more than anyone else I want to say mahalo to the classy couple that bought this entire legendary ohana of tenors. As far as I can tell the world just needs more successful people caring about others. Aside from a healthy passion for great ukes I can’t think of a trait that I respect more than generosity. And mahalo to you for checking out The Ukulele Review. You can support our efforts by shopping at The Ukulele Site.. Learn more about Luthiers for a Cause HERE. Wow, these ukes are wonderful! And for such a worthy cause. God bless the luthers and the purchasing couple .A great cause . What a collection of beauty and talent ! Thank you Andrew for your participation in all this.